I hope everyone is well and in good spirits. Before I get deep into this letter I want to apologize to the membership for my public absence over the past few months. I have high expectations of my staff but much more so of myself and in that regard I have failed recently. This is something I endeavor to change over the next four months. As much as I want to be able to do everything and accomplish everything I have to remember that I am but one person. This letter has been changed and edited multiple times as I view it through a pragmatic lens of what I know can be done vs what I hope can be done. 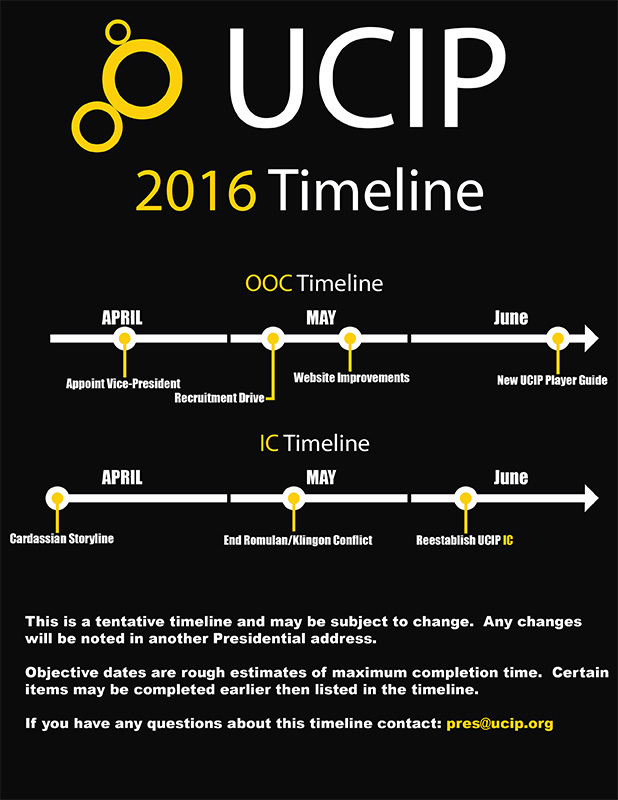 Last year my main focus was to shore up the OOC aspects of the organization. Overall I feel that I accomplished a majority of what I set out to do in that regard. However, not everything was finished to the level that I would have liked. Certain aspects of the website need redefining and redeveloping. The current layout was never intended to be permanent but only as a holdover until a design could be sent to me. Since that has not happened I have decided to just commission an artist to complete the graphic designs I envision with full ownership going to UCIP of the completed works. If there is a UCIP member who is interested in being commissioned for this, please send an email to pres[at]ucip.org with a sample of your work. With a new layout done I plan to implement a system within the new website that will allow for applications to be conducted directly through the website. I am also looking for help in keeping the website updated. If anyone is interested, please also email pres[at]ucip.org. Please like our pages. 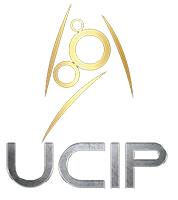 Going forward they will play an active role in the organization along with our forum community (http://forum.ucip.org/index.php). Aside from the website aspects one of my major goals was to overhaul the UCIP Academy this half of my term (new website and etc). I still plan on starting on this project with the help of our wonderful academy personnel but this may not be something I will be able to complete over the course of the next four months. One of the primary objectives is to develop a new player guide that will streamline and modernize our roleplay experience and expect to at least finish that. Finally, one of my goals was the implementation of physical rewards some the primary awards. This will be the start of that implementation. I have already developed designs for some of the primary awards (Bergen/Orion) and winners can expect them within 4 months of this letter. I know these are slightly (ahem…) delayed but here are the 2015 end of year awards. While not an award per say I want to first announce that Starbase Versailles is now a full sim. I have watched her development and I can say without a doubt that Versailles is deserving of that status in every way. The logs are wonderful, overall consistent participation, and the crew simply gels together. With that said as my first award announcement I want to announce that Admiral Cerywyn is hereby awarded the Kirk Medallion and the UCIP Award for her work with Versailles and reestablishing it as a major sim in UCIP. Also for her commitment to UCIP through the years, wonderful writing, and great presence I am formally promoting Cerywyn to the rank of Fleet Admiral. Congratulations Cerywyn, you deserve it. For her amazing work with Academy I want to present Stormy O’Brien with the Presidential Medal of achievement. Having had several discussions with her towards the end of last year it was easy to see her passion and devotion to academy along with the drive to make it better. The next few awards were a bit harder. Over the past year every sim has had struggles in some form or another. So, these awards are presented to the sims whose flaws have been outshone by their excellence. I want to present the USS Cortana with the Orion award. Having witnessed and participated in several of her sims last year I can say without a doubt that the Cortana is a fun game and the crew is great to be around. I want to award the USS Vindicator with the Bergen simming award. Anyone who reads through their sim archive for last year will see nothing less than amazing writing and storytelling. Finally, there is no award to cover the level of dedication and work that Donald has done for UCIP. Heck, he even has an award named after him! So I’ll simply thank him for his awesome work through the years in helping to keep UCIP going and ask that the membership to also take time to thank him for his tireless efforts if they ever see him on. That is all for this letter. I have attached a timeline to it that represents my plans over the next three months. If you have any concerns or questions, please contact pres[at]ucip.org (we are using this list for the moment due to the spam on president@).